4 node servers comprising in total. 2U Chassis with 12 x 3.5" drive caddies (take 3.5" SATA or SATA drives). Rack Rails. In good condition and in full working order - Tested, 12 months warranty. DELL PowerEdge C6100 including 4 x XS23-TY3 Nodes. All 8 x Processors (2 x CPU Per Node) installed ( 32 CPU Cores/ Logical Processors/ 64threads). Backplane: 1x 12 Bay 3.5” LFF SATA (takes up to 12 x SATA drives - 3 x SATA for each Node). DELL PowerEdge C6100 including 2 x Nodes. (each node). All 8 x Processors (2 x CPU Per Node) installed ( 16 CPU Cores/ Logical Processors/ 32threads). Backplane: 1x 12 Bay 3.5” LFF SATA (takes up to 12 x SATA drives - 3 x SATA for each Node). Dell C6100 are powerful ultra-dense 2U servers. 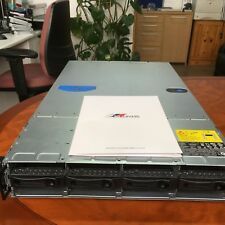 This model, the XS23-TY3, has 4 compute nodes within the chassis. Each node is connected through a mid-plane “interposer” to a maximum of 6 x 2.5” SAS/SATA disks. DELL PowerEdge C6100 including 4 x Nodes. All 8 x Processors (2 x CPU Per Node) installed ( 32 CPU Cores/ Logical Processors/ 64threads). Backplane: 1x 12 Bay 3.5” LFF SATA (takes up to 12 x SATA drives - 3 x SATA for each Node). This 4 node server has two nodes populated and 2 empty slots. No HDD's are included, but there are 6 empty caddies. DELL PowerEdge C6100 including 4 x XS23-TY3 Nodes. All 8 x Processors (2 x CPU Per Node) installed ( 48 CPU Cores/ Logical Processors/96threads). 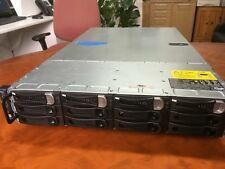 Storage: 4 x 2TB 7.2K SATA NHP- Drives 4x NHP Blank caddies included (2TB Per Node) (Takes up to twelve) . DELL PowerEdge C6100 including 4 x XS23-TY3 Nodes. All 8 x Processors (2 x CPU Per Node) installed ( 48 CPU Cores/ Logical Processors/96threads). Storage: 4 x 2TB 7.2K SATA Drives in NHP Blank caddies included (2TB Per Node) (Takes up to twelve) . DELL PowerEdge C6100 including 4 x XS23-TY3 Nodes. All 8 x Processors (2 x CPU Per Node) installed ( 48 CPU Cores/ Logical Processors/96threads). Storage: 12 x 2TB 7.2K SATA NHP- Drives included (6TB Per Node). Here we have a Dell XS23-SC server. 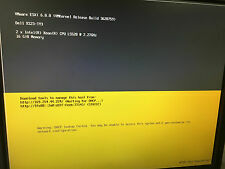 These are custom cloud servers that are based on the Dell C6100. It has a total of 8 Quad core low power CPUs and 32Gb of RAM. Very powerful server and power efficient server. 1 x Dell PowerEdge C6100 XS23-TY3. 12 x 1TB SATA 3.5" HDD. All In One. Extended Warranty 1/2/3 years. We recycle. PALLETS 10069 & 10070 LOCATED TOGETHER AT START OF L58 AND L59. DV4VY 0DV4VY. 1 x DELL C6100 CLOUD SERVER SATA CABLE TRI CABLE X3 BUNDLE INTERPOSER. Why Buy From Us?. T4MPW 0T4MPW. 1 x DELL C6100 CLOUD SERVER PROCESSOR COOLING HEATSINK XS23-TY3. Why Buy From Us?. 295J6 0295J6. 1 x DELL C6100 CLOUD SERVER EXPANSION PCI-E RISER BOARD CARD. You can buy in set of 6 max. we do not take any responsibilty after this. Monitor & TV. Desktop PC. PC Components. Why Choose Us! 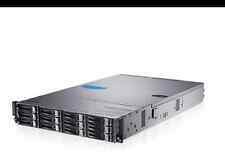 Dell PowerEdge C6100 2U Ultra Dense 4 x Node Rack Mount Server. 2U Chassis can take up to 24 x 2.5" SAS/SATA Hard Drives (up to 6 per node). 4 node servers comprising in total. DELL PowerEdge C6100 including 4 x Nodes. All 8 x Processors (2 x CPU Per Node) installed ( 48 CPU Cores/ Logical Processors/96threads). Backplane: 1x 12 Bay 3.5” LFF SATA (takes up to 12 x SATA drives - 3 x SATA for each Node). DELL PowerEdge C6100 including 4 x XS23-TY3 Nodes. Storage: 12 x 2TB 7.2K SATA NHP- Drives included (6TB Per Node). All 8 x Processors (2 x CPU Per Node) installed ( 48 CPU Cores/ Logical Processors/96threads).